Girls Rock! 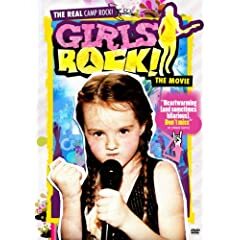 follows several young campers as they not only learn musical skills but also lessons of empowerment from indie rock luminaries like Sleater-Kinney's Carrie Brownstein and Gossip's Beth Ditto. The St. Louis Post-Dispatch called this the "best film of the year," be sure to check out the Girls Rock! film website for more information. Another music DVD out tomorrow is The Secret Policeman's Balls, a collection of five benefit shows from 1976-1989 that combine comedy and music. This 3-DVD set features John Cleese, Michael Palin, Peter Gabriel, Pete Townshend, Eric Clapton and and many more entertainers. Two older science fiction series are the highlights of the week's television releases. The second season of 1967-68's The Invaders is at the top of my Netflix queue, and the complete Sam Raimi-produced M.A.N.T.I. S. series is finally available on DVD. Siitcom fans can complete their Cheers collection with the series' final season, and I am sure someone is happy that Blossom: Seasons 1 & 2 is finally out tomorrow. Among the week's feature film releases, I am most looking forward to The Father, the family drama from Iranian director Majid Majidi. Groundhog Day/a> and Zodiac are available in the Blu-ray format tomorrow. Dom Irrera: Is This Thing On?